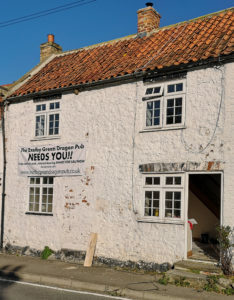 One of the special things about what we are doing with the Exelby Green Dragon is renovating what used to be two cottages along High Row. Over the years these charming 18th Century cottages have been left to decay and become completely unloved with part of one them becoming what is the ladies toilets for the pub. With the help of Hambleton District Council we have secured Department of Housing Communities and Local Government funding to help us create Exelby's first Community-Led Housing. This will ensure that there will be affordable housing available for rent to those who live or work in Exelby and the surrounding area for generations to come. It will be a generously proportioned period two-bed cottage with a lovely courtyard garden only a stone's throw away from one of North Yorkshire's finest community owned pubs - what more could you want? What better legacy for the village and for future generations could there be? Over the coming months we will bring you progress reports on the cottage renovations as well as our work on the pub itself. Please do not hesitate to get in touch if you are interested in renting the cottage and being part of this very special place. The cottage - two into one will go! 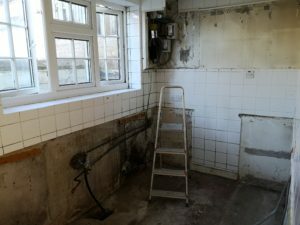 The cottage kitchen - just a lick of paint needed here and there!